Just six months ago, many Canadians were sure they understood the housing market. Calgary was suffering under the weight of low oil prices, historically-low borrowing costs were displaying no signs of moving higher, and the price gains in Vancouver and Toronto appeared unstoppable. Six months ago, the consensus was that mortgage rates were not going higher any time soon. The economy was underperforming, leaving the Bank of Canada on hold. Plus, global bond yields were stuck at historic lows. Then, against all odds, Donald Trump triumphed in the 2016 US presidential election. The American yield curve steepened as Trump’s outlined policies were viewed as inflationary, and the yield on the Canadian five-year bond followed suit. Remember, banks price fixed-mortgage rates off bond yields. The Royal Bank of Canada moved first, hiking fixed rates between 25 and 40 basis points. Suddenly—and without much warning—Canadians were facing higher borrowing costs, thanks to Trump and Ottawa’s recent regulatory changes. Ottawa has made it harder to get a mortgage. Concerned about the risks the housing market posed to the financial system, Ottawa recently tightened mortgage regulations once again. In early October, Finance Minister Bill Morneau announced a stringent stress test for all insured mortgages. This has greatly reduced the average Canadian family’s home purchasing power. Ontario has doubled the tax rebate. Rising home prices and strained affordability has pressured the Ontario government to take action. Targeting foreign buyers with a tax similar to the one implemented in Vancouver wasn’t on the table. Instead, Ontario’s Finance Minister, Charles Sousa, opted to double the maximum tax rebate already in place for first-time buyers, from $2,000 to $4,000. The move effectively means that anyone buying a home in Ontario for $368,000 or less will not have to pay any provincial land transfer tax. The rebate, however, is only available to Canadian citizens and permanent residents. Vancouver’s housing market goes cold. 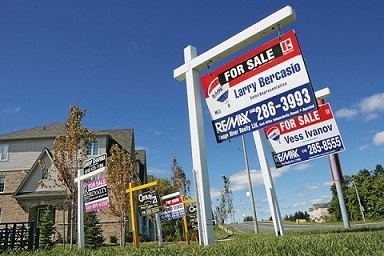 While it felt like a sudden shift for Canada’s hottest housing market, the signs have been there for months. While the number of Vancouver homes changing hands peaked in early 2016, it was the double-digit, year-over-year price increases that dominated all the headlines. For many, it seemed that Vancouver’s astronomical house prices would never fall back to earth. Then, the BC government slapped a 15% tax on foreign buyers in the city. Sales volumes fell drastically, and prices are now falling on a month-over-month basis. National Bank Financial is now forecasting a 20% correction for Vancouver detached home prices in the next 12 months. The crash in crude oil prices, which began in late 2014, hit Calgary hard. Sales volumes plunged and prices retreated. Consequentially, the number of homes changing hands rose almost 16% in October compared to the same time last year. The Calgary Real Estate Board warns this could be temporary. However, CREB notes that sales activity in the city is staring to resemble normal levels for the first time in two years.